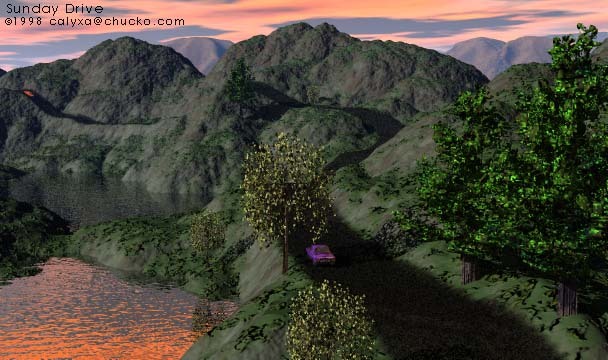 This image is one 512 grid terrain. This technique can make roads which swoop over your Bryce terrains. If you have not done so already, you may wish to review the previous lesson on making flat roads. The start and end of the procedure for making swooping roads is the same as for making flat roads. Prepare a Photoshop document with your terrain in the RGB channels, a blank alpha channel, and a posterized copy of the terrain in a fifth channel. You may also want to keep a backup copy of the original g2h in a sixth channel. In the previous lesson, I complained about Photoshop's posterize 'filter.' What I was really looking at was Filters->Gallery Effects Vol 1->Poster Edges, which isn't right. When I discovered Photoshop's Image->Map->Posterize... dialog, I knew I had found the right tool. Terrain posterized to about 30 levels. You can pretty much put your roadpath anywhere you want. If you try to not cross too many contours, especially those which are close together, you'll have better results. Roadpath selection saved as alpha channel. Switch to the poster channel and load the selection from the alpha channel. Copy. Create a new channel, this will be your 'working' channel. With the roadpath selection still active, paste in the copy from the posterized layer. Zoom in. This is the first tedious part, but it doesn't take too long. On the right are before and after images of a section of the posterized roadbed. The red area was the next darker poster level, but because this area does not extend all the way across the road, it gets filled in with the color of the adjacent poster level. If the area had been the next lighter poster level, again it would have been filled in with the adjacent grey. Filling in a darker area makes a road fill, filling in a lighter area makes a road cut. I used the paint bucket with no anti-aliasing and low tolerance to do these cuts and fills. Option-click to pick up the color of the adjacent grey, then fill in the darker (or lighter) 'disconnected' patch (areas like the one shown in red here). The green section in the before image shows how even though the contour lines completely cross the road, they do not cross it at right angles. A similar green area in the after image shows how it was adjusted. I used the pencil tool to straighten the contours. Proceed along the entire road length sampling the various poster levels and re-adjusting their angle to the road. This doesn't have to be too precise, because we're going to mix it up a little bit in our next tedious step. I like to save a copy of the fixed posterized road bed in a spare channel, just in case. You should be on your 'working' channel, with a copy of the fixed posterized roadpath selected. Copy and paste, then use the arrow keys to nudge the copy up as many pixels as you can before you start seeing black in between the copy and the original roadpath. (I go 'til I see the black, then nudge it back the other way a few times). Re-load the original alpha channel roadpath selection. Paste again. You want to reload the channel every time before you paste so that the pasted roadpath goes onto the exact right spot. Nudge the new copy the opposite way from the first copy, again, as far as you can without seeing black between the first two and the new copy. Repeat that yet again for the other two arrow keys - reload the original roadpath selection, paste, nudge. The most important bit is to end by loading the selection and pasting one final copy in the center of this mess where the roadpath belongs. Repeat what you did in step four, this time using the 'wideroad' channel as the selection you load. Nudge the copies of the conglomerate made in step four again as far as they will go without showing black between the growing road area and the freshly pasted copy. Again, end by loading the 'wideroad' selection and pasting in a final copy without any nudging. Now that you've carefully put these copies everywhere, it's time to finally blur it. 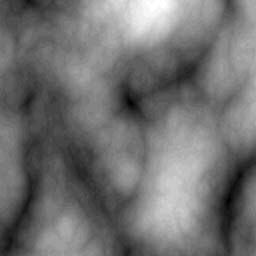 Use a Gaussian Blur of around 1.5 to 2 pixels. Then repeat the Gaussian Blur several times until it starts to look smooth. That'll be at least 10 or 20 times. 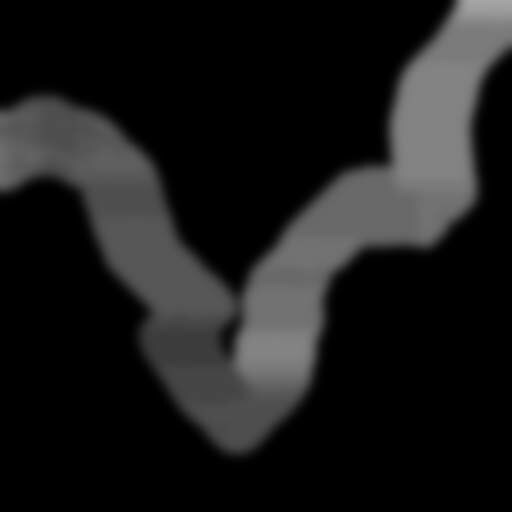 Do not try to skip blurring several times by making the initial blur much wider in pixels, because that'll incorporate some of the black which we're carefully avoiding by making all those copies of the roadbed, and that will make your road cut severely into the terrain. 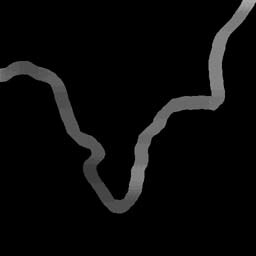 Load your original roadpath from the alpha channel while viewing your 'working' blurred layer. Copy. Switch back to your original terrain. Paste. Your road is carved. 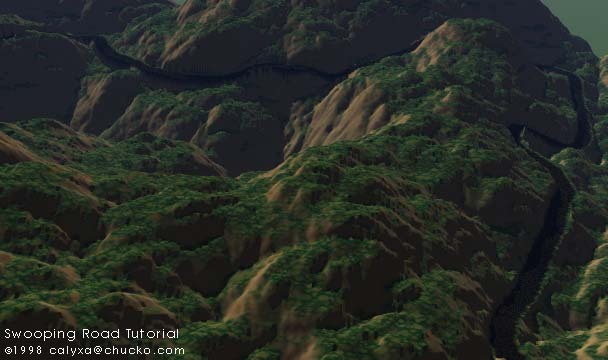 Use the texturing information from step six of the previous tutorial to have the road paved with a different material than the surrounding mountain. Note that it's kind of hard to see the road here in this terrian map. That's a good thing. If you can see your road too clearly when you get to this step, your road will be making some very deep cuts and/or some very tall fills.